Built of steel and completely refurbished in 2016, the Truk Master is the newest liveaboard to venture into the waters of Truk Lagoon, welcoming aboard 16 guests for 7 or 10 night dive safaris. The four decks provide ample space for relaxation, dive equipment and camera preparation, whilst the experienced crew ensures you receive only the highest quality service on your diving holiday. Guests can choose between lower, middle and upper deck cabins, each of which are en-suite and have individual air-conditioning units. Communal relaxation areas are split between the middle and upper decks comprising of a spacious indoor dining area. There is a camera set up station, with guest storage drawers, lounge bar with comfortable seating and a plasma screen, plus a shaded outdoor seating area and a sundeck. Dive equipment is set up and stored on the rear of the middle deck. All guests are allocated an individual set up station, with under bench storage for masks, fins and other personal items. A central camera table can be used to store prepared equipment ahead of the dive, with dedicated rinse tanks provided. Divers can take advantage of the on deck shower hoses or use the starboard side deck head to rinse off between dives. The Captain welcomes you to join him at the fly-bridge, from where you can soak up the stunning views of the islands of Truk Lagoon! Length: 37m, Breadth: 7m, Engines: 2 x Cummins 520 HP, Cruising Speed 10 knots, Generators: 4, Construction Material: Steel, Water Storage 20 tonnes. Two main engines and 4 full-time generators power the Truk Master to a top cruising speed of 10 knots. 3 x Coltri-Sub M16 compressors with cascade storage for fast filling provide divers with an endless air supply and quick fills between dives. There is also a nitrox bank system (extra charge for nitrox). Re-breather friendly (no rental available). SMB’s & Nautilus Lifeline are available to rent on board. Onboard voltage is 110/220 volts. US plug fittings. Adapters are available FOC. There is an indoor charging station for cameras etc. Camera table and camera rinse tank is on the dive deck. The Truk Master is fitted with the latest board navigation and safety systems. EPIRB for divers (Emergency Position Indicating Radio Beacons), Life jackets, Life rafts, Fire system, Satellite Telephone, Oxygen and First Aid are also available. The diving is done from both 2 dive tenders and from the Truk Master, depending on the dive site and sea conditions. Typically the divers are divided up into three groups, each with their own Dive Guide. Each tender has a sturdy, custom ladder so getting in and out of the water is easy. When diving directly from the Truk Master, there are entry / exit ladders located at the rear of the ship providing easy access to the dive platform. Boat Only price per person includes: Transfers from Blue Lagoon Dive Resort to the Truk Master, accommodation in a standard cabin, based on 2 sharing, 1 deck towel + 2 cabin towels per person, bed linen, a/c and ensuite bathroom. Full-board basis, including 3 main meals, snacks, drinking water, soft drinks, fruit juices, tea and coffee. 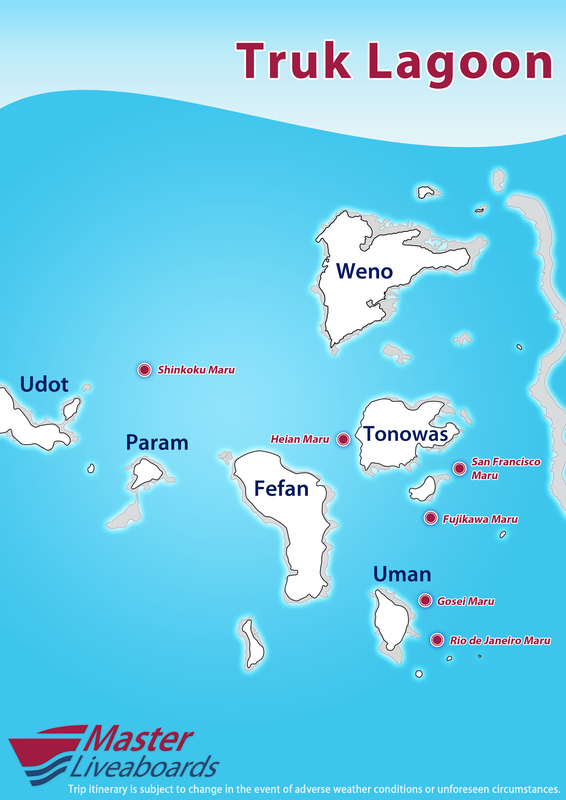 Up to 4 guided dives per day, (3 day dives & 1 optional night dive), land excursions – weather & itinerary permitting. There is an extra charge for nitrox and 15l tanks.